Jeanne Michaels, Jaap van Etten, Sherry Whitfield, Pieter Tigelaar and Bob McCullough are the founding Fellows of the Crystalline Fellowship. have wanted to collaborate in the work that they both do with crystal skulls, spirituality, subtle energies etc. They have continued to work towards that goal and now there has been a huge opening! The time is right and it has begun! Yes, this is just the very beginning - but it IS a beginning of something a little different in this field. This is the birth of a true Fellowship - encompassing far more than two people. This alliance has been forged in love, friendship, respect and the mutual desire to assist in raising the spiritual vibrations of all Beings involved in this co-creation known as our Universe and Humanity! In the coming months and years the Fellowship will share resources, offer online courses from top people in the various fields, and be a place to have honest discussions! Topics will be as varied as crystal skulls, earth energies, angels, healing, working with subtle energies, multi-dimensional Beings and much more! from the very beginning - and to be kept informed about the latest happenings! Click here for a YouTube video Intro by if the embedded frame above doesn't work. Jeanne Michaels, Jaap van Etten and Sherry Whitfield! Why is it called the 'Crystalline' Fellowship? The planet we live on is a crystalline being. All stars and planets, the infinite numbers that are out in space, are all crystalline beings. We live within crystalline energy fields and they support us in every aspect of our lives. Human beings have a responsibility towards the planet, the crystalline being that unconditionally supports everything that lives within her field. We are living in a time in which people are again reconnecting with this wonderful being and all that she offers. We are learning again how we can live in a state that makes it possible for us to fulfill our purpose on Earth: contributing to the whole through raising our vibration, expanding our consciousness and awareness and express our full potential. This is the only way for us to become again real!! There are many ways we can do this and there are many tools that can help us. The most powerful tool is the crystal skull. This is a consequence of the fact that it is made from a part of the crystalline being we live on, of its unique energetic qualities and because it is a doorway for higher consciousness beings that are willing to support us on our journey, both individually and collectively. Sherry Whitfield and Jaap van Etten share many visions and ideas. 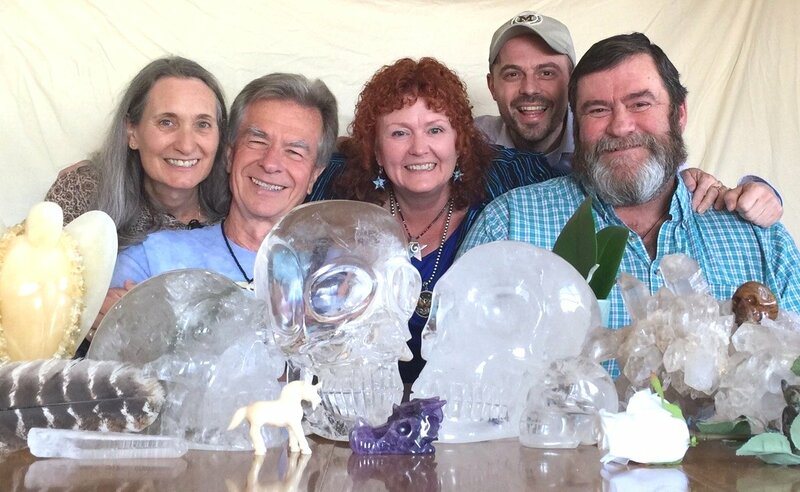 Both have a passion to help people individually and collectively and both have a deep connection with crystal skulls and the Earth. Often they have talked about collaboration. Supported by people close and very dear to them they made the decision to turn their ideas into a practical form. This is the basis on which they create the Crystalline Fellowship. In the initial phase Sherry and Jaap, with the support of the other members of the Fellowship - Jeanne Michaels, Bob McCullough and Pieter Tigelaar will lay the foundation of the work of the Fellowship. The Fellowship will expand as time goes on, to include others who have the same vision and those that are participants in what the Fellowship offers. There is room in this fellowship for anyone who knows or wants to know, how to be real. In every sense of the world. The vision is to create a platform through which those that resonate with the vision can share their unique gifts to contribute to raising the vibration of both individuals and the collective. Raising the vibration will allow the expansion of awareness and consciousness, will allow a remembering of who we are and what we are here to do. This will create “real people” instead of people that live according to ideas of how they need to be in order to fit within the system they exist in. By being real people we can co-create a reality that is based on love, joy, happiness, abundance and oneness, at first with Gaia, Mother Earth with all that lives on her, and ultimately with All That Is. This is only possible through synergy: a synergistic working together based on the understanding that love is the key.